Why are the Solnhofen quarries of Germany so important to paleontology? The Solnhofen quarries of Bavaria, Germany, are important not just because they are home to the oldest known bird fossils, the Archaeopteryx lithographica. This area is what paleontologists call a Lagerstatten (“fossil lode” or “storehouse”). Because of their unique prehistoric conditions, these sites have preserved numerous animals, giving us a virtual snap-shot of the fauna during this time. There are only approximately 100 fossil sites around the world designated as Lagerstatten, with each representing different time periods, and all rich in fossil varieties. The quarries were the site of a quiet, warm-water, anoxic (lacking oxygen) lagoon. It lay behind reefs on the northern shores of the Tethys Sea approximately 150 million years ago. The tropical climate at this time was perfect for the animals and plants living along its shores. And the ocean itself teemed with life beyond the stagnant lagoon. Storms would sweep in dead or dying animals from the ocean; dying land creatures either fell into the lagoon, or drifted into it from the shore. Their bodies fell to the bottom of the lagoon and were covered by soft lime mud; little oxygen was present to decompose the organisms. The ensuing fine limestone rock preserved, in exquisite detail, the remains of over 600 species, including the smallest dinosaur, Compsognathus, pterosaurs by the hundreds, numerous insects, and, of course, the remains of Archaeopteryx lithographica. 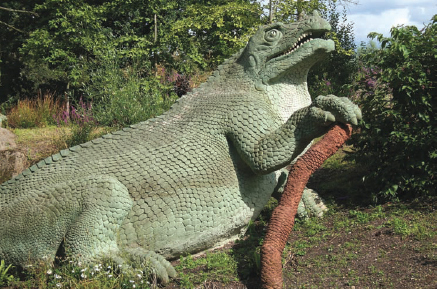 Famed paleontologist Richard Owen designed these dinosaur statues in 1852; they are still on display at London’s Crystal Palace Park (Big Stock Photo).